Each week we put out an initial list of 10-18 Swing Trade ideas for our SRP Members and Stockreversals.com Members as well. Although not a full on comprehensive list of all of our ideas, we often will pick 1-2 from this list as actual alerts during the week for our SRP Members if warranted or market conditions or news flow dictates. The list is below the charts in this report. For the week ending Nov 2nd, indices started off extremely weak on Monday, setting new lows; however, they finished the rest of the week strong closing in the upper half of their weekly range. The SP 500 finished the week up +2.4%, with the Russell 2000 up strongest at +4.3%, Nasdaq 100 up +1.7%, and the Dow up +2.4%. 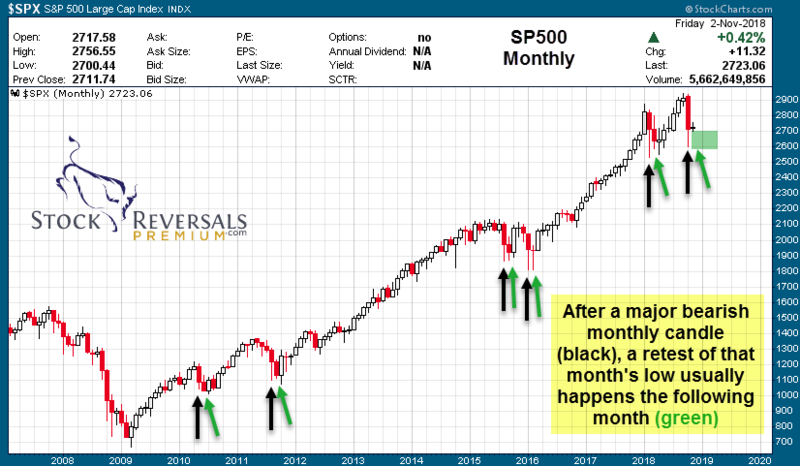 It was only a matter of time that a strong rally was due, and given the fact that October had as much as a -12% decline during the month, a strong finish to end of month was likely (in our view). Sure enough, October closed the month “only” -6.9% down, recapturing much of its losses in the final 2 days. 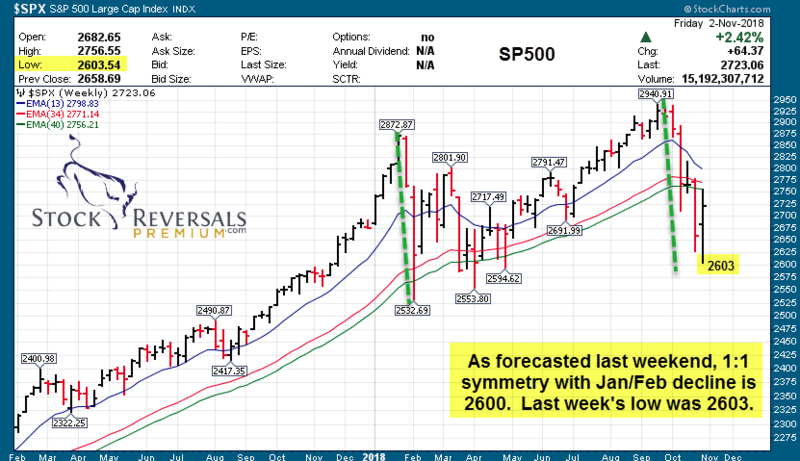 Note that the SP 500 bottomed at 2603, just 3 points away from our forecasted 1:1 symmetry level in last weekend’s report. The big unknown is the the US Midterm Elections happening this week (Tuesday), and from that point on, the markets should be able to digest policy and congressional relations with this administration. The markets do NOT like uncertainty, and it would not be out of the question to see a lot of volatility this week. Our bigger picture view, as posted in our morning reports and on social media the past week, is that we are looking for a bigger retrace off the major lows towards 2810-15 level, however as you will see in the monthly chart below, we would likely expect a retest of October lows (or at least an attempt) sometime in November. Perhaps that happens early this week or just after the elections, depending on what happens. Bigger picture, we are enter the seasonally strong holiday window during Nov-Dec. Assuming 2603 was the low, we would expect the markets to retrace the entire leg down from 2940-2603 to projected minimum of 2772 to 2811. 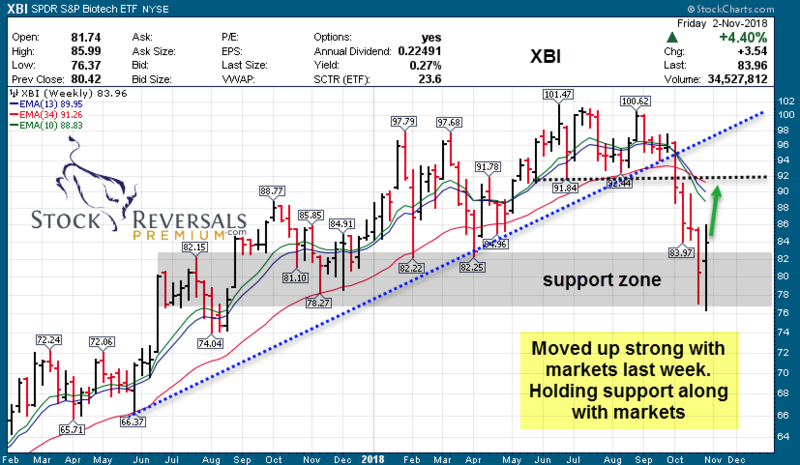 Biotech (XBI) was up +4.4% for the week and we did get a NASI buy signal as mentioned we were watching in last week’s weekend report. 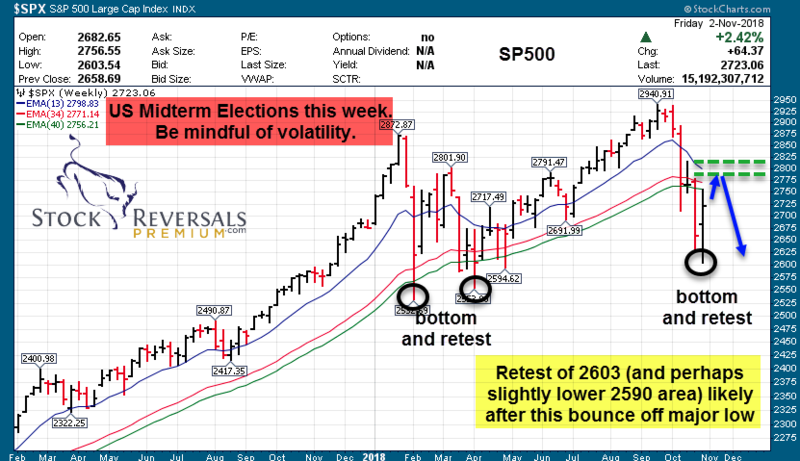 We are cautiously optimistic that last week was the start of an initiation move off the lows, however bottoming is a process and we believe that volatility will continue to be front and center, even as we start a seasonally strong period of time in the markets. We use a combination of behavioral analysis along with the technical and fundamental approach to identify reversal pattern opportunities in stock swing trade setups in addition to our high regarded macro market forecasting. Swing Trade Candidates: Each week we provide 8-15 Swing Trade ideas to consider as part of our SRP service. We often pick a few from the list during the week as actual alerts. This week we have 16. YETI – post IPO base, target 18+. Designs, markets, and distributes products for the outdoor and recreation market. MTCH- 10 week base, holding above the big Aug gap candle. Above 46 and we think 54-56 is achievable. Provides dating products in over 190 countries online. BURL – Continues to break out, but may need to consolidate. American national off-price department store retailer. GOGO – extended and retrace back to key moving averages. Earnings this week. Still like it for higher. 7-8 price target not out of question. Provider of in-flight broadband Internet service and other connectivity services. BA- 10 month base pattern; earnings recently were strong, and held up fairly well through the last 4-5 week selloff with the markets. American multinational corporation that designs, manufactures, and sells airplanes, rotorcraft, rockets, satellites, and missiles worldwide. MOMO – Up 15% this week. Perfect 1:1 symmetry and bounced. 38-40 would be likely if the markets get off the ground. Chinese provider of mobile social networking platform. PLNT- Consolidation last week, bouncing between the 13/34 weekly EMAs. Coiling for higher. Monthly uptrend still remains strong. Operator of over 1500 fitness centers. TMO – Looks coiled for higher. Company provides analytical instruments, equipment, reagents and consumables, software, and services for research, manufacturing, analysis, discovery, and diagnostics. SAVE – Strong outperformance vs. SP 500 last few weeks. Up over 10% since we first put it on weekend list. American ultra-low-cost airline carrier. LTHM – strong post IPO bounce this week, up another 7.5% since we added it to the list; Manufactures and sells performance lithium compounds that are used primarily in energy storage, specialty polymers, and chemical synthesis application. AAP – 9 week consolidation, could be sector rotation going on. Retailer of automotive parts and accessories. VICI – 8 week base near highs. Real estate investment trust specializing in casino properties, based in New York City. MPW – breakout to new highs from 10 week consolidation. Real estate investment trust (REIT) that invests in healthcare facilities subject to NNN (triple net) Leases. WHD – Up 8% last week, holding 34 weekly EMA. Wellheads and pressure control equipment. MKC – All time high breakout last week, and any pullbacks should be bought for continuation. Company manufactures, markets and distributes spices, seasoning mixes, condiments and other flavorful products to the entire food industry.